HIJACK > Food for your Ears > Hijackers' Tunes and Mixes > New from Instinkt, Audio Habitat & Kryptomedic on AutomAte Tech! Inseparable German duo Rune & Kaiza, aka Instinkt, deliver a trademark solo effort backed with a collaboration with fellow countrymen Audio Habitat and hot-right-now MC Kryptomedic. Kabuki is the more rolling of the two. A precise, robotic technoid groove bringing to mind an android army marching heads-down into a black hole. There is no escape from the hypnotic rhythm as we are pulled over the event horizon. Gasket features a veritable German dream-team with the combined musical talents of Instinkt & Audio Habitat and the vocal prowess of Eatbrain’s MC Kryptomedic. Snarling basses and full-bodied drums underpin Krypto’s relentless social commentary. 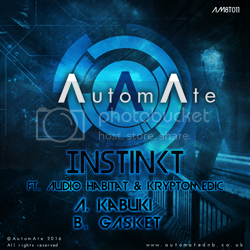 Re: New from Instinkt, Audio Habitat & Kryptomedic on AutomAte Tech!